Besides being young doctors and live in the United States, Lucia Agudelo, Mercedes Vela Charles and Abraham Vela have another thing in common: the passion for Family Medicine and desire to exercise in their communities. 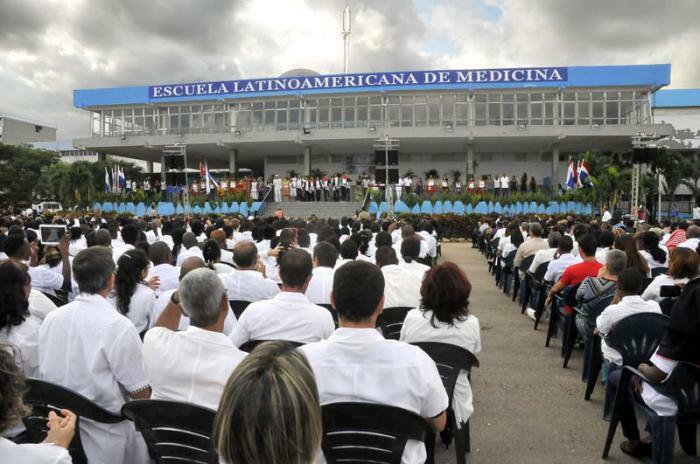 However, this is not a simple coincidence, but a vocation that found its way in the Latin American School of Medicine (ELAM) of Cuba, where all of them studied. Despite residing in the same country and having a similar love for health care, they might never have known each other except for the study center that hosted them on the Caribbean island, where they spent six years of their life, and now they look with respect and gratitude. The three graduates of that educational institution created in 1999 by the Government of Cuba are again in the United States with the goal of fulfilling the commitment acquired when studying for free: to go to their communities and practice their profession. I always felt very good in Cuba; the people there embrace you as if you were family, everything is shared, and the training was of the highest quality, Agudelo told Prensa Latina about her experience in that territory. The young doctor, of Colombian origin and resident in California, who finished her studies this year, recently participated in the Day against Blockade 2017, in which she rejected the siege imposed by Washington on Cuba for 55 years. From her stay in 2011, Agudelo recalled the first two years, which she described as the most international days, because she stayed full-time in ELAM with people from all over the world. I feel well trained, without any lack of knowledge, said the young woman, at a time when deciding between choosing a residence in the United States or returning to Cuba to study the specialty of Comprehensive General Medicine. This criterion is shared by Charles, who graduated last July from the center that has so far graduated 170 Americans out of a total of 28,500 other doctors from 103 countries. According to Charles, the Cubans ‘have a heart of gold’ and are very supportive. ‘I miss the Cuban culture and people; there are more sociable, here in the United States, specifically in Washington DC and Virginia, nobody interact that way, ‘said the young woman from Virginia. She explained that at first it was a challenge to study in Spanish, and she often made her maximum effort because she also read the content in English, until later she found it easier to speak the language, partly thanks to the help of her own classmates. According to Charles, during her training she greatly enjoyed the close relationship between patients and family doctors, the basis of primary health care in Cuba. For his part, Vela described as invaluable the clinical experience and the sense of humanism that he acquired in Cuba. The young man born in California and of Guatemalan origin graduated in 2016 and is currently in the process of choosing a residency in Family Medicine, ‘equivalent to General Integral Medicine in Cuba’, explained in reference to a way of practicing the profession of which he is very proud. When talking with him, you can see how important it was that stage in his life, and in his comments are often repeated the words gratitude, solidarity and humanism. The doctor recalled that he learned of the possibility of studying in Cuba through a professor at the University of San Francisco. The idea excited him and he got in touch with the Interreligious Foundation for Community Organization / Pastors for Peace, which supports the ELAM in the selection of American students. Studying medicine in the United States would have been very difficult, it would take me a long time and I would end up with a huge debt that would not allow me to work where I wanted to: my community, he said. ‘I was able to learn from other religions, tried meals, listened to languages and danced music from everywhere. And most importantly, I created a family all over the world. I can go to almost any continent and I have someone there, and for me that brotherhood is very significant. Recalling that time, he reiterated his gratitude to ELAM, the people of Cuba, and to the historic leader of the Cuban Revolution, Fidel Castro, who had the idea of creating that school. Thanks to that opportunity, I was able to return to my country without owing anything, ‘the only thing we have with Cuba is a moral contract to work in our communities, we all want to fulfill it, and it really is something necessary here,’ he added. Esta entrada fue publicada en Cuba, English, Política, Salud y etiquetada Cuba, ELAM, Fidel Castro, health care, Pastors for Peace, USA. Guarda el enlace permanente.